Our warehousing and logistics solution is fully integrated with our online inventory management software providing you with complete visibility of our warehouse facilities and your products. 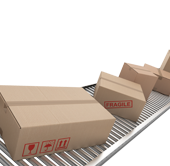 Importantly, we have the operational space to comfortably accommodate all your inventory, fulfilment, kitting and distribution needs with full scalability to meet your evolving needs. Utilising our SPLASH Magic™ technology, our warehousing and logistics team ensures that online orders are despatched efficiently with track and trace updates. Our technology also enables us to provide you with an extensive suite of reports to effectively manage your inventory and costs. By analysing the data in SPLASH Magic™, we are able to manage and forecast trends in your inventory usage. Finally, we also have a dedicated pick, pack and fulfilment facility that can provide kitting and assembly services for marketing campaigns and local area marketing.